Jim recruited veteran comedy writer Jack Rose to work with Muppet Show head writer Jerry Juhl on the script for the Muppets’ second feature film, The Great Muppet Caper. Jerry was deep into the intense taping schedule of Season 5 of series, so Rose’s traveling to London was the only practical way for them to work together. Later, their efforts would be combined with those of writers Jay Tarses and Tom Patchett, with the two teams sharing credit for the final script. Of course, Jim also made contributions to the script, both during development and during production. 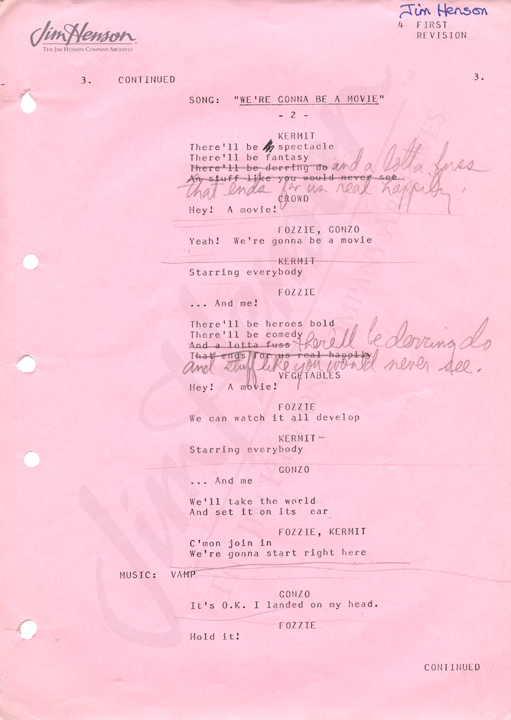 Learn more about how the script for The Great Muppet Caper came together. 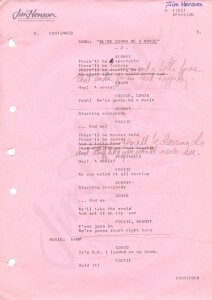 Jim’s script for The Great Muppet Caper with his annotations. This entry was posted in 03-March '80, 1980, Great Muppet Caper and tagged Jack Rose, Jay Tarses, Jerry Juhl, London, Muppet Show, Tom Patchett. Bookmark the permalink.